The tone pot on my 1971 Push/Pull's C6 neck needs to be replaced. I have a replacement pot. When I pulled the cover plate to remove the old pot, I found what appeared to be a messy aftermarket wiring job. Now I'm questioning whether the neck selector switch is wired correctly. It works, but so far I haven't been able to reconnect the wire to the pot. It doesn't look like I would expect a factory job to look. As long as I'm in there, I might as well make sure it's done right. Can somebody tell me how to correctly connect the new tone pot and neck selector switch? Both the old pot and the new one have three loops/lugs. 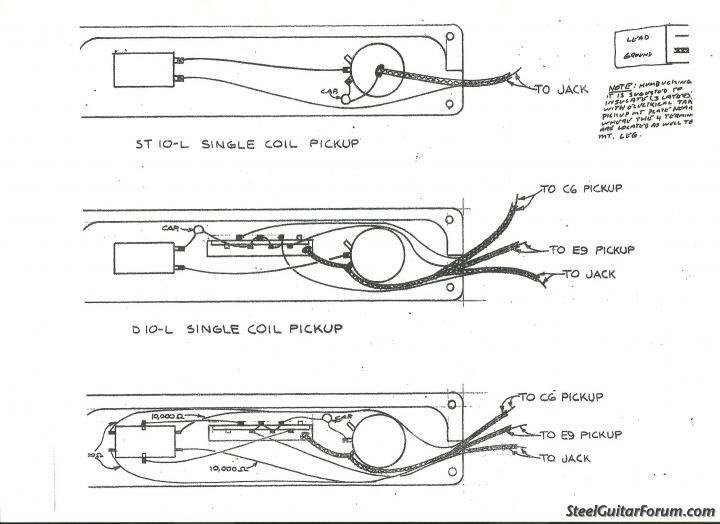 There are only two wires from the selector switch to the tone pot. A simple explanation or diagram will probably work. The old saying says that a picture is worth a thousand words. I hope I don't need a whole chapter.